2017 has been a mixed bag for Bollywood. While big releases like Shah Rukh Khan‘s Jab Harry Met Sejal and Salman Khan‘s Tubelight failed to set the box office on fire, small films like Irrfan Khan’s Hindi Medium and Ayushmann Khurrana’s Shubh Mangal Saavdhan performed much better than expected. 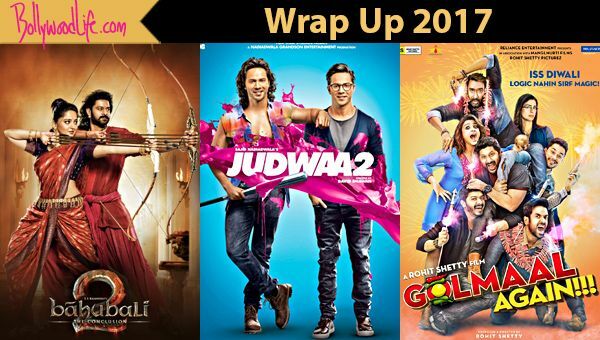 Ajay Devgn’s Golmaal Again, Varun Dhawan’s Judwaa 2 and Akshay Kumar’s Jolly LLB 2 also proved once again that franchise films will always perform well at the box office. But which film has emerged as the biggest box office hit and the highest grosser of 2017 till now? Well we took a look at the box office collections of each release this year and here is our list of top 5 highest box office grossers of 2017 till date. Prabhas and SS Rajamouli’s magnum opus was one of the most anticipated films of the decade. After Baahubali: The Beginning ended on a cliffhanger, everyone wanted to know why Katappa killed Baahubali. The intrigue factor paired with fantastic content and stunning visuals invited the audience to watch this film again and again. The Telugu movie broke several records across the world but it’s the Hindi dubbed version that created surprising records. It is the highest grossing Hindi film with a lifetime collection of Rs 510.99 crore. The fourth film of the Golmaal franchise, starring Ajay Devgn, Parineeti Chopra, Arshad Warsi, Tabu and several others, ventured into the horror comedy zone and made a killing! Not only was there huge buzz surrounding the film, but also good content paired with excellent performances made this movie a treat for the audience this Diwali. Largely benefiting from the festive period and fantastic word of mouth publicity, Golmaal Again was the first Bollywood release to cross the coveted Rs 200 crore mark this year. Being a remake of Salman Khan’s Judwaa, a lot was expected from this Varun Dhawan starrer. And it did not disappoint the audience! The entertaining plot paired with some hilarious jokes and fun moments, made this crowd’s favourite. People went to watch this with their families again and again, enabling it to become the second highest grosser of 2017 till date with a box office collection of Rs 138.61 crore. Shah Rukh Khan’s Raees was one of the most anticipated films of the year. And though the film had an interesting story, the high expectations and the sub par execution limited its run at the box office. In fact, its clash with Hrithik Roshan’s Kaabil also hampered its chance of earning a larger box office collection. But even after all this, Raees has managed to grab the third spot in our list of top box office grossers of 2017. Akshay Kumar’s satirical comedy, which highlighted the issues of sanitation, hygiene and lack of proper toilets in India, was one of the strongest content driven films of the year. Not only did the interesting yet comic story line keep the audience engaged, but it also gave out a brilliant message. With a fantastic run at the box office, Toilet: Ek Prem Katha grabs the fourth spot on our list with a lifetime collection of Rs 134.22 crore.